Since 2000, the inflation adjusted buying power of monthly Social Security benefits has fallen by 34% (Source: Senior Citizens League, Alexandria, VA). Let’s be real about what this means – the cost of living has risen more than benefits have and translates into recipients’ Social Security checks not going as far as they used to. Those who are new to receiving Social Security aren’t feeling this impact – yet. However, those who have received benefits for a period of 10 to 15 years should feel the impact dramatically. In total, about 47 million Americans who paid into Social Security now receive monthly income. Statistics from the Social Security Administration (SSA) show that for those individuals over the age of 65, Social Security income makes up about one-third of the total income they receive annually. Within the pages of the same report from the SSA, the research finds a 34% decrease in purchasing power since the year 2000. Part of figuring out this equation is to understand how much the cost of living has gone up since 2000. The SSA report shows that typical retiree expenses grew an aggregate of 96.3% since 2000 compared to Social Security income, which equaled a cumulative aggregate growth of 46% over the same period. It’s shocking to see the data behind the loss in purchasing power of Social Security income for our retired workers isn’t it?! Making matters worse, housing and medical are two of the fastest growing annual costs on an inflation adjusted basis, according to the Bureau of Labor and Statistics. If you look at certain medical costs for retirees, like Medicare Part B, you will see that premiums have risen 195% to $134 from only $45.50 in 2000. How does this happen? Well, the government increases Social Security based on the Consumer Price Index for Urban Wage Earners and Clerical Workers. (That’s a mouthful!) When we take a closer look at the index, the average increase since 2010 has been 1.2% with no positive adjustment in 2016 and a paltry increase of .3% in 2017. Before anyone gets too excited about the 2% increase in 2018, it followed in lock step with increases in Medicare Part B that wiped out much of the annual step up. There are critics of the government using the Consumer Price Index for determining how much a retiree’s annual cost of living adjusts to. Some estimates show that retirees’ actual cost of living has increased by more than 3% annually since 2000 and Social Security benefits should go up by at least that much. In conclusion, it seems most logical to us that the government is discreetly increasing Social Security payments by an amount that would hopefully go unnoticed by retirees while trying to mitigate the long-term damage of draining our critical Social Security program. These paltry annual increases to your Social Security income barely make a dent when compared to the actual cost of living going up. Yet, we do like the fact that the low increases help balance the viability of the Social Security system with creating a reasonable benefit for retirees who paid in to the system. 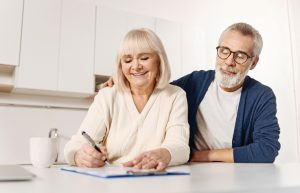 Hopefully this article helps provide a little positive light on how the drain to Social Security has been slowed while at the same time informing those currently on Social Security that your checks don’t go as far as they used to!